Too many families steer away from skiing because, “It’s too expensive!” Skiing is a pricey pastime – no doubt, but so is a day at Disney ($94), a Shopping spree at the mall or a new electronic video game. I could argue that skiing is far healthier than any of that equally steep stuff. Resorts are recognizing that cost is a major deterrent to downhill (especially in a down turned economy) and some ski areas are combating the cost phobia with free learn to ski and snowboard specials. Particularly with early season deals for first timers, families with kids 8 and older. The month of January is Learn to Ski or Ride Free Month sponsored by the National Ski Area Association and Snowsports of America. Resorts nationwide offer a Get into Skiing or Snowboarding package for anyone 8-years of age or older. Each package includes a two-hour lesson, rental equipment for the day and an all-day Learning Area lift ticket. That’s what I call a ski stimulus plan. Come early January, one of the best vacation values in New England is Children’s Fest week at Sugarloaf and Sunday River. During the post-holiday week in January, the slopes empty out, the price drops, and Sugarloaf gives free learn to ski and snowboard programs along with free lift tickets and rental gear for kids ages 4-12. The real deal: parents must purchase a ski & stay package for 3 or more nights, then their kids ski and stay free – with instruction and equipment to boot. When your kids are in elementary school, they can miss a few days for family holiday, and you save big time over prime time prices. Your youngsters will love seeing mascots Amos the Moose and Blueberry Bear while they learn to turn with The Loaf’s pros. As parents, you will love the savings, the snowy getaway, Sugarloaf’s slopeside lodging, and the après ski atmosphere. It’s worth the trip, and did I mention it’s free for kids? 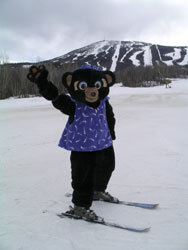 Sunday River’s Children’s fest has similar deals, activities and appearances by their mascot Eddy the Yeti. So no more excuses about expenses, make this the year you start the family sliding. After all, resorts are wheeling and dealing to get you to to take up the sport of skiing.